I know I showed you a Fabergé brooch last Friday, but I found another one I really like, so here it comes! It was made by workmaster August Hollming, around 1908-1927! This brooch is made of gold, centered by an oval purple sapphire, encircled by rose-cut diamonds. At each end of the brooch sits a brilliant-cut diamond in mille-grain settings. The length of the pice is 1.5'' (3.7 cm), and it's price is 6,625 pounds. Get it at Wartski! 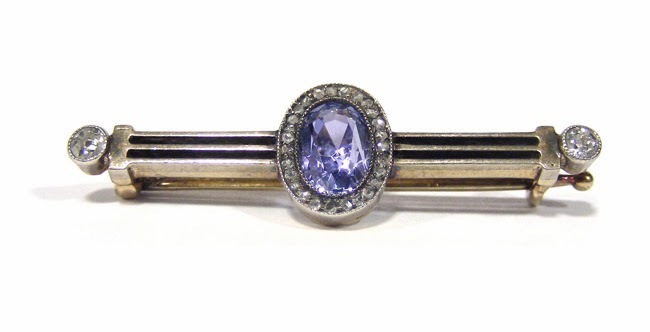 This is such a gorgeous brooch, just love the colours here, such a striking blue! Om nom nom... Fin blå ton.